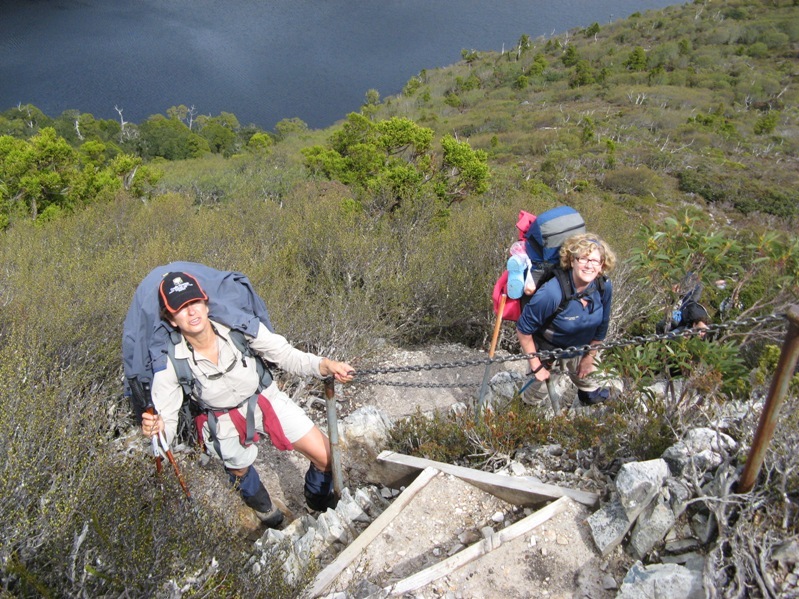 The Overland Track in Tasmania is a fantastic 6 days hiking experience. It is isolated, can throw up tough conditions and challenge you both physically and mentally. In fact, unless you are adequately prepared for bitterly cold and mind numbing conditions in winter, you risk serious problems (and the possibility of death) No joking. Walking the Overland Track in winter needs thorough planning, excellent gear and experience in tough Tasmanian conditions. In this post we are shamelessly plugging our Hiking the Overland Track eBook, not as a way to make us rich, (at $A14.50 each, we reckon it will take us 200 years plus to become rich!) but as a good resource to help you plan your trip and reduce the risks to a manageable level. We have just finished reading Aaron White’s blog Aaron’s Assonant Advertures In Australia and want to share some of his posts with potential Overland Track hikers. We highly recommend reading Aaron’s Overland Track posts to get the full story. We really enjoyed Aaron’s writing style and story telling ability – it is great read. This first post : Overland Track Chronicles – Rugging up sets the scene for his recent winter trip. Sue and Frank – hiking in Tasmania – winter – can’t be too bad, we are smiling! As reasonably experienced Tasmania hikers, reading his story immediately created warning bells in our minds, so we decided to post some snippets of his experiences and make a few comments about them so others who attempt the Overland Track in winter can be better prepared. Mmmm gortex. I felt the smooth, yet rubbery sleeve and subtley turned the affixed price tag to my direction. $800. “So will this keep me warm as well?” I asked. I found a cheap rain jacket for sale at a random Sydney shop for $40. In Launceston, I bought my stove, fleece coat, fleece gloves, tent and some wool socks at the local K-mart. I wasn’t a Super Backpacker Man, but I think I was alright. In the Overland Track book we go into detail about gear selection, what you need to take and what is not required. That night though, I didn’t sleep, not even for a minute. I tossed, turned and froze to death under my pile of blankets in the heated Tasmanian room. Launceston isn’t even in the mountains. I already knew my light summer sleeping bag would not be enough, even when fully clothed. I thought of my gear, my garbage bag gaiters, my lack of sleeping mat. Why did I buy potatoes? I rolled out of bed at 5:59, yelling at my 6:00 alarm to wake up. I saw that it was the morning of May 13th (duhn duhn duh!!!!). I repacked my bag, cut back on some of the food, tossed out my potatoes. I removed the one pair of comfort clothing I saved for my first night off the mountain and cut back on a few other odds and ends. The bag was still too heavy, but it was at least manageable. I still wasn’t content. I threw on my hiking boots and headed to the 24hour Kmart for a camping mat. Freezing to death from no ground insulation was not the way I wanted to kick it. I walked a half block before I hit another obstacle to my coming hike: my ankles were in intense pain. Many hikers leave on a sunny day, unprepared, without raingear or warm clothing and die when trapped in a snowstorm. I was undertaking it in mid-May, when you don’t have to pay the fee, but have to deal with less desirable weather and very short days. Hiking during the non fee paying season is Ok if you are experienced and prepared. There is minimal support from Tasmanian Parks and Wildlife Service and less people around to help get you out of trouble. That put me at just more than halfway done with the day. I was already exhausted: my back hurt, my ankles hurt, and one layer of face had been not so carefully removed by unhindered, blowing precipitation. There was thankfully only 30 minutes left on the open mountain face. I collapsed upon opening the door. I just wasn’t in enough shape for this first day of climbing, but a good nights sleep would hopefully give me the strength for the next. The hut was quite nice, with wooden bunks to sleep 25 and a gas heater to dry off all of our gear. Even with a rain jacket, rain pants, fleece coat, hooded sweatshirt, t-shirt, and jeans, I was soaked all the way down to my thermals. I had a backpack cover over my water resistant backpack, but this proved useless: everything in my pack was wet. That day, even the super backpackers, with their $1000 dollar backpacks and special waterproof covers learned the lesson that “waterproof” is a myth. Do not take cotton clothes such as jeans or track pants, once wet they will NOT DRY . I jumped out of the creek, gave it the finger, and stomped through the pouring rain back to the hut and threw my fifty pound pack in the corner. Five minutes later, I had my socks wrung out, I had my clothes put back on and was ready to move on. I removed my completely wet gear and went into my backpack for my dry change of clothing. Even after repacking everything in garbage bags, my clothes were still damp. The left me with no dry clothes and the temperature was quickly dropping. Within minutes, I was shivering uncontrollably and started feeling a bit faint. I could tell I was showing the early symptoms of hypothermia. I threw on my fleece coat even though it was wet. That is one thing I love about polar fleece, it is the amazing fabric that maintains warmth, even when wet. The previous night, Brian (a guy Aaron met on the Track) had slept in a tent in the rain, instead of the hut. Everything he owned, including sleeping back was soaked. His body was not forgiving him for the prior two days’ punishment. He was cramping, worn-down, cold. Instead of pushing on that day, he decided to rest another day. This was an option I chose to wave, despite the inconceivably worse weather that day. Since I was not going forward, I wanted to head back and see all the various side trails along the way I had passed up. – At this point Aaron decided to return to the Cradle Mountain end of the walk and not risk worse weather conditions that were forecast – a wise move. I awoke in the middle of the night with the startling discovery that the Socks Paradox was in fact a myth. Once I donned my fifth pair of socks, wrapped my feet in a sweater, put the bottom of my sleeping bag in a canvas shopping bag, I was able to make my feet merely cold. It was a long, blustery night. The wind tested the structural integrity of the cabin. I wasn’t the only person who had a cold night. A young British bloke spent the night with merely a blanket. His one pair of socks was soaked from the previous day’s walk. The sneakers he brought were still wet and he had no rain coat. The temperature was below freezing that day. Despite this, he pushed on. This is how people die. I was in my element, until I reached the top of the mountain. Suddenly, I found myself in North Dakota mid-blizzard or maybe on top of mountain mid-blizzard, same difference. I pushed forward through knee-deep snow, which was good, because it stabilized me from being toppled by the wind. I was glad it was only a couple of miles back to Kitchen Hut. Inside the Kitchen Hut, I found an Aussie family from Brisbane, with a twelve year old child. They started the previous day, but got trapped from the excessive winds. I was actually quite glad to see them safe and alive; other hikers the previous night had told me of this family. They decided to head back to the park with me, so we headed out into the blizzard. At first it wasn’t too bad, but after fifteen meters, the wind came back with a vengeance, the strongest I’ve faced on the trail. Being from Queensland, the boy had never seen snow before, now he was stuck in Antartica. They wisely turned back. Many thanks to Aaron White for his great insights and honest appraisal of his Overland Track experience. Remember, you can read Aaron’s eight posts on his blog, Aaron’s Assonant Adventures in Australia. 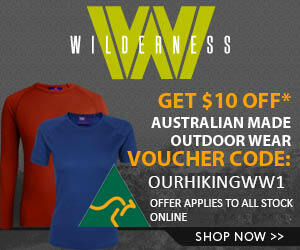 It was a nice post on "Overland Track – Tasmania in Winter – some lessons". Hiking is one of the most enjoyable pastime or recreation that everyone will definitely enjoy. Hiking is considered to be the most relaxing experience one can have, it is such a great time bonding with one’s family and friends. Aside from that, Hiking can also be a great way on how one can be able to live simple or experience a life without all the gadgets and technologies which are comfortable to use. Great pics – great adventure. We are leaving for America in a couple of weeks. I'll buy your ebook when we come back – next Feb.
Keep up the good work..love the blog – so full of info about a place so few have trekked. Hi, we are the Brisbane family who were stuck in Kitchen Hut in May 2009. We got a kick out of seeing us mentioned on this blog. Our son did think he was in Antarctica, the worst weather all of us have experienced in our lives. The experience hasnt put us off though, I am heading down to walk the South Coast Track next week. The world is a small place hey? I sometimes wonder if you ended up doing the Overland Track or was that the end of it for that trip? Must have been rough weather! no snow, harder walk though! Welcome and thanks for sharing your trip report. You guys seemed to have a great time. Love the line “Can you feel your feet?”, must have been cold. about the track conditions from Cynthia bay to Narcissus hut in winter ? Will it be a mud fest? Depends on your definition of mud? There is mud and there is MUD. You will probably get more in there than on the rest of the OT. There are a few boggy sections but nothing like the South Coast track or other places in Tasmania. What ever happens the whole track will be either wet, muddy, rooty, slippery or duck boarding. I assume you will be wearing gaiters. Have a great trip and hope the weather is great! I wish more people read this sort of stuff before heading out into the wilderness- I’ve worked a few summers as a discovery ranger at Cradle Mountain and one of my various duties was to try to intercept Overland Track walkers and convince them that the summer sleeping bag and the see-through plastic raincoat was not going to cut the mustard as far as safety (let alone comfort) is concerned. It is always a challenge on a fine sunny day trying to convince overseas (and some Australian mainland) visitors that it really can and does snow in summer and you need to have the gear for that. To be honest I am astonished that more people don’t die out there. Gaiters and boots are essential kit- not only for safety and comfort but so people are more inclined to stay on the track and less inclined to turn the fragile alpine plant communities into a bottomless oozing quagmire. Thanks for dropping by and taking the time to comment. Yep, we have seen a few interesting set ups on different trips we have done down there. It must be so frustrating in that sort of job as you can’t really turn them back. That is one of the reasons we wrote our eBook on the OT, to try and tell it straight and in simple terms. Part of our “target” market , well, let’s say people we thought might buy it, was backpackers. It turns out, most people who buy it are those that plan carefully and read widely. Not quite the backpacker market! Going to be doing this walk in a weeks time (Summer) Loved reading the article and thought I would share an interesting story from a friend who did the trip. He headed out in summer with basically none of the right gear. A pair of thongs and some blunstone boots for footwear. Day 1 heading to the track he was lounging in his thongs when a ranger advised him that he couldn’t do the walk in those. His response was to do the entire trip in a pair of thongs. We planned to do this trip on a budget similary to the auther of this piece however what it turned out to be was a $5000 gear buying frenzy where we have gone way overboard! Quality fleace, a $800 jacket and $400 pants backpacks at $600 each and it just doesnt seem to stop! When will you do it? I am planning to do it on my own starting April 16th. Looking for companions, but am pushed for time as need to catch the bus from Lake St Clair on the 22nd (ferry at 12:30 from Narcissus Hut). PLease let me know how the weather was! Hi guys 3 of us finished the walk march 18 we had the most glorious of weather only rained a day and a half out of seven. I used your gear list to pack from (Thanks) but at the start my pack still weighed in at 25kg? I was completely self sufficient ie tent first aid kit etc.what weight should i be aiming to get my pack down too? whilst carrying every thing as a solo walker. Sadly as i found out my trusty hybrid pack that i have used on a few overnight hikes in scouts just doesn’t cut the mustard when it comes to multi day walks, so am now on the lookout for a new pack and any hints and tips to get the weight down as i would love to and will be back for each season with winter being my last season to walk. At the very start when we were telling people we were doing the walk several said they had done it a few times and i thought to myself WHY would you do an 80km walk several times. Well i now know why and cant wait to come back and do it all again. My husband did a 6 day walk in 2013 in April. He did no training preparation and had given up smoking a few months before. After walking the first 200 metres he realised he should have done some training. His walking mates encouraged him to keep going. He was carrying a 25 kilo backpack. He found it had to breath and was ‘sucking’ air. Once he had walked for a few hours, he realised it was no turning back. He had no mobile phone with him, so he percivered. He found it the most difficult thing he had ever done in his whole life. When he returned, he was coughing a lot and went to the doctor and discovered he had lung cancer. HE DIED 3 months later. My message is -1) If you suspect you might have a respiratory or heart problem, get it checked out thoroughly before you go.If you do, don’t go on the walk. 2) Train with your boots on and a 25 kilo back pack for several months before you go. 3) If you feel after a short distance you are not going to make it, PULL OUT and go home. He might still be alive, if he hadn’t done this walk. Sorry for the loss of your husband. It must have been (and still be) a very difficult time. Thanks for your excellent advice. Getting really fit, preparing well and knowing your limits make for a safe trip. There is no shame in pulling out and heading back to the start of a track. Hope things get better for you as time passes. Dear Cherry I am going for a holiday to Tasmania soon and whilst reading up about the place came across your story. I note it will be the 1st anniversary today since yr husband’s passing and understand how you feel. The years become a little easier and time is a healer. Hi thanks for this blog. Just wondering how you went organising transport during winter. We are staying in Cradle Mountain and were planning to rent a car but now looking at details for where to leave the car and options for buses to take us between Lake St Clair and Cradle Mountain to start or finish. Any advice? Cheers.